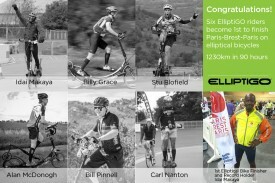 ElliptiGO, Inc. is the San Diego-based company that created the world’s first elliptical bicycle. Combining the best of running, cycling and the elliptical trainer, the ElliptiGO® provides a comfortable, fun and effective way to exercise outdoors. It delivers a high-performance workout experience that closely mimics running outdoors while eliminating the impact. Elliptical cycling is an effective way to build cardiovascular fitness without aggravating injuries and is great for everyone from the weekend warrior to the elite athlete. The full line of ElliptiGOs can be purchased at retailers nationwide and through the company’s website: http://www.elliptigo.com.